On Friday, February 21, at 7 p.m. Andy Fitch was joined by Julie Carr, Eric Baus, Andrea Rexilius, Eleni Sikelianos, and Dan Beachy-Quick at Counterpath to help launch his new book Sixty Morning Talks: Serial Interviews with Contemporary Authors (Ugly Duckling Presse). 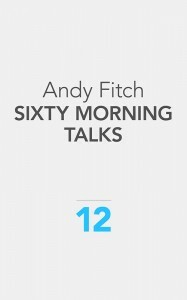 Sixty Morning Talks: Serial Interviews with Contemporary Authors provides sixty transcribed interviews with poets who released books in 2012. Rather than advance an overarching argument concerning “the state of poetry,” this book engages a broad range of authors often subdivided into ideological, aesthetic, generational, national and identity-based camps, and taps the accessibility of vernacular speech to offer new means of comparative study, cross-reference and discursive collaboration. Sixty Morning Talks is part of a three-book project including Sixty Morning Walks and Sixty Morning Wlaks, both forthcoming from Ugly Duckling Presse. Andy Fitch’s collaboration with Amaranth Borsuk, As We Know, will be published by Subito Press later this year. His collaboration with Jon Cotner, Conversations over Stolen Food, will be published by 1913 Press in 2015. For Letter Machine Editions, he and Cristiana Baik are currently assembling The Letter Machine Book of Interviews. Fitch edits The Conversant and Essay Press. He teaches in the University of Wyoming’s MFA Program.